NEW in Package, as pictured. Perfect for any bar or holiday gathering, they make wonderful gifts, fun decorations and party favors. Lightweight non-woven felt fabric, 60% Polyester and 40% Acrylic Felt. No washing instructions provided, so assume surface-wash only. Fits Most Armless Dining Room Chair Backs up to 18-inches wide. Add some fun to your next brunch, dinner, or winter themed birthday party this Christmas holiday season... Sure to bring smiles to everyone who sees them! 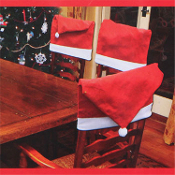 Cute bright red and snow white Santa Hat chair back covers are an easy and festive way to dress up chairs and delight kids and guests of all ages. Slip over the back of most chairs for a special decorating surprise at any spring themed or pretend tea party! Use your imagination... Can also be used as pillow slipcovers!